Meridian held an installment of the Global Business@Meridian breakfast series at Meridian’s campus on July 27, 2017. 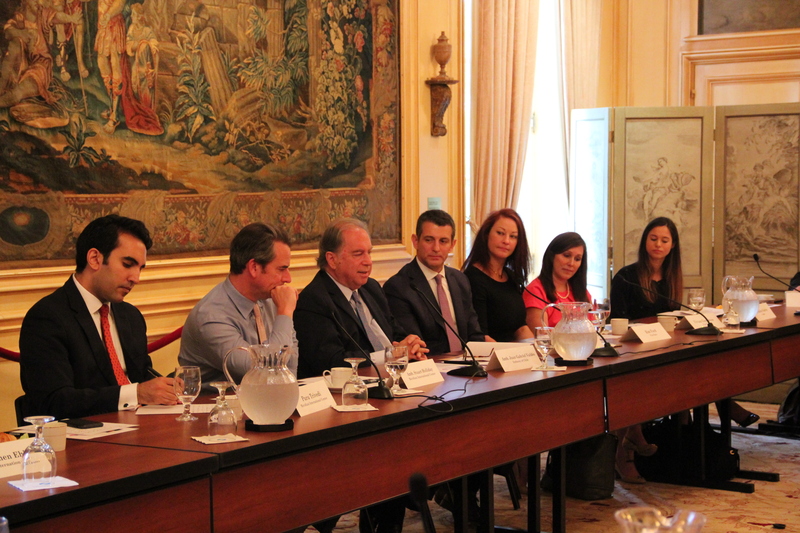 Hosted by Mr. Adam Rosman, Executive Vice President and General Counsel for First Data, the program featured Ambassador of Chile, Juan Gabriel Valdés and drew over 15 corporate leaders together to engage in an off-the-record dialogue on economic challenges and opportunities in Chile. Following around-the-table guest introductions facilitated by Ambassador Stuart Holliday, Mr. Rosman highlighted the longstanding, fruitful relationship between Chile and the United States. He acknowledged that programs like Start-Up Chile, the leading start-up accelerator in Latin America and one of the top 10 in the world, have contributed to significant economic growth and financial inclusion and align closely with First Data’s goals to increase financial inclusion and entrepreneurship globally. Following Mr. Lewis’s introduction, Ambassador Valdés offered comments on the current state of Chile’s political climate, explaining that similar to the United States, there is currently a strong sentiment of distrust amongst Chilean citizens towards political leaders and the elite. Despite these challenges, Chile continues to have strong institutions that have allowed for consistent growth and peace and have opened up ways to address these societal pressures. These strong institutions have allowed for the opening of trade, investment, and technology and will continue to do so allowing for Chile to be seen as an economic opportunity to the United States and the world. Ambassador Valdés remarked that China is currently Chile’s largest and strongest trading partner, but that the regional alliance with the United States is also strategic and beneficial to advancing their trade priorities and despite current political tensions in the U.S., Chile still sees the United States as an important and strategic partner. Diversification: Copper is still one of Chile’s main exports in the global economy, currently taking up about 40% of the country’s total exports, but there has been a concerted effort to diversify. Ambassador Valdés shared that the country would like to export more seafood and fruits, largely due to China’s influence and the increasing demand. Additionally, the United States is currently working with Russia and the E.U, to build the world’s largest scope in Chile for space observation which has presented opportunities in the energy industry. Intellectual Property: Ambassador Valdés acknowledged that the issue of Intellectual Property rights and laws in Chile is a complicated and ever-changing issue. However, comparatively, Chile is one of the most equipped countries to deal with this as they are one the most compliant with standard IP rules and guidelines. The legal framework is slowly, but surely, catching up to modern demands and climate when it comes to intellectual property which will further increase opportunity for American businesses. Trade opportunities and challenges: The basis for the longstanding relationship that exists between Chile and the United States is rooted in both countries’ commitment to human rights, democracy, and free trade. Chile hopes to continue to practices and tenets that are outlined in the TPP and the expectation of free trade that was established under President Bush. This is particularly important for Chile’s trade relations with Asian countries. Regionally, Chile continues to face hurdles with neighboring countries such as Brazil and Argentina – countries that have a protectionist approach to trade policy. As their policies change and trade opens up, Ambassador Valdes anticipates even more growth for the region as a whole. The Pacific Alliance is the most promising vehicle for achieving that openness and inclusion in the region – something that China has been a strong proponent for. Meridian looks forward to working with Chile on a number of upcoming initiatives and remaining engaged with the Embassy of Chile in Washington.